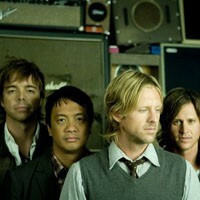 Switchfoot at the National | Night and Day | Style Weekly - Richmond, VA local news, arts, and events. There&apos;s hardly another band out there today that&apos;s been able to assimilate the ideals and themes of contemporary Christian music into mainstream pop music as well as San Diego&apos;s Switchfoot. With its 2003 breakthrough album, “The Beautiful Letdown,” anchored by radio hits such as “Dare You to Move” and “Meant to Live,” singer and guitarist Jonathan Foreman and his band successfully delivered the kind of melodically crunching anthem rock that came off as merely honest and with conviction and not holy, name-dropping, self-righteousness. Following its 2006 release, “Oh Gravity,” Switchfoot has hit the road in support of its latest album, “Hello Hurricane.” The band performs Y101&apos;s Snowball Concert with openers Paper Tongues and Proverbial at the National on Saturday, Dec. 5, at 7 p.m.